1. Simplify the expression (51/3-52 )6. 3. Rewrite using fractional exponents: 53√22 + √7 √ 32. 4. Simplify: 58 . 3√52 · 5-3 / 3√55. 5. Which of the following is a rational number? 6. Derek is purchasing lunch meat for the class picnic. There are 300 people attending the picnic. Derek expects that for every 10 people 11 sandwiches will be eaten and that 20 pounds of meat will make 90 sandwiches. How much lunch meat should Derek buy? 7. 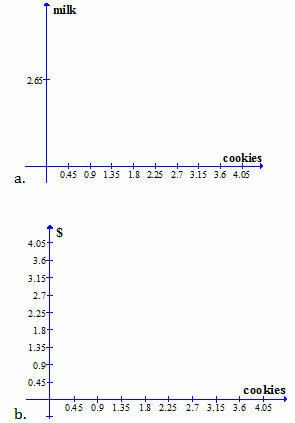 Label the axes and choose a scale for the graphic model of this problem: Meghan bought cookies and milk for her classmates. She spent $.45 per cookie, one cookie each per student, and $2.65 on one gallon of milk to share. How much does she spend altogether? 8. A certain radioactive material has a half-life of 7 days. A test sample of this material has an initial mass of 400 kg. Which of the following would be the most appropriate unit to use when labeling the time axis of a graph of remaining material vs. time elapsed until 6.1 grams remain? 9. Usain Bolt set a world record of 9.58 seconds for the 100 meter dash. White-tailed deer can run at 48 kilometers per hour for short periods. If Mr. Bolt and a white-tailed deer run a 100 meter dash at these speeds, who would win, and by how much? 10. After getting his wisdom teeth pulled, Matt was prescribed 60 mg of Codeine to be taken every 4 hours for 5 days. The pharmacy has 30 mg pills. How many pills should Matt receive when filling the prescription? 1. D: Use two properties of exponents: bx– by=bx+y and (bx)y. That is, the exponent on a base is the sum of the powers in a product (if the bases are the same), and the resulting power when an exponent is raised to a power is the product of the two exponents. Begin by adding the exponents within the parentheses. Next multiply that sum and the exponent outside the parentheses. (51/3 · 52)6=(57/3)6=514. 2. C: Each of the statements follows an exponent rule. In A, the exponents inside and outside the parentheses are multiplied. (8½)2=8=23. In B, the base is the same for each term in the product, so the exponents can all be added. 41·41 · 41 · 41 4½=41+1+1+1+½=49/2. In statement D, the base is the same for each term in the quotient, so the exponents can be subtracted. 6√5/6√52 =51/6/52/6 =5-1/6. C follows the same rule as B, but there is a mistake: 51/3 · 52/3·51/3=54/3=53√5 ≠ 5√5. 3. B: Fractional exponential notation can be obtained with the following identity: y√bx=bx/y · 53√22 + 7√32 = 5 · 22/3 + 32/7. This cannot be simplified further by other rules governing exponentials because the bases are not the same. 6. A: Let the units guide the solution. First, create conversion fractions using the given information: 10 people = 11 sandwiches, and 20 pounds = 90 sandwiches. Then, start with the number of people and multiply by the fractions ensuring that the units will cancel as appropriate. The answer needs to be pounds of lunch meat so pounds should be the only remaining unit. Derek needs to buy 73.333 pounds of lunch meat. 7. D: Since she buys one cookie for every student, the amount she spends depends on how many students there are; the cost is the dependent variable, dependent on the number of students, which is the independent variable. Choices C and D show this relationship with the independent variable on the x-axis and the dependent on the y-axis. 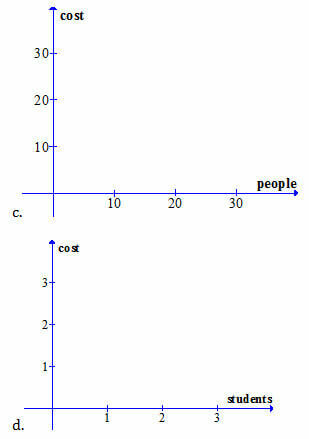 The scale of the cost axis in choice C is too large, though: for 30 students Meghan only spends about $16. Since the scale of the cost axis in choice D is more appropriate, choice D is the best answer. 8. C: The time period of one half-life is one week. It will take many half-lives for the mass to decay from 400 kilograms to 6.1 grams. At 10 weeks, for example, the mass is 400(1/2)10=.3906 kg=390.6 grams. Expressing time in units smaller than weeks will result in an unwieldy and unnecessarily finely-divided time axis. On the other hand, labeling the time axis in years does not provide enough divisions to accurately resolve individual half-lives. Labeling the axis in weeks is therefore the best choice. The deer’s speed is 13.33 m/s, and to find the deer’s time, divide the length of the race by its speed: 100 m /13.33 m/s =7.5 seconds, and the deer wins! Compare the two times: 9.58 (Bolt) – 7.5 (Deer) = 2.08. The deer wins by 2.08 seconds. 5 days-24 hours /1 day–60 mg /4 hours · 1 pill /30 mg=5 days–24 hours / 1 day–60 mg/4hours–1 pill /30 mg=60 pills.